Everyday is Halloween for the bike messenger. 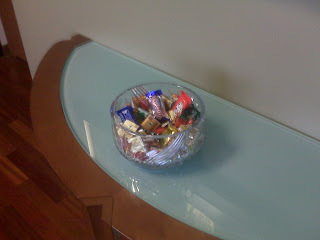 At least half of the offices I visit have candy bowls. This one is above average. I'd give it a solid B as there are candy bars to be found. What would be a D? 100% hard candy that looks old. Occasionally on a really busy day, I'll have to pull an all candy power lunch. Not a well-balanced part of the day, but when you're exhausted and starving with no lunch break coming, holding five hot tags, it's hard to say no to a bowl of any kind of food. 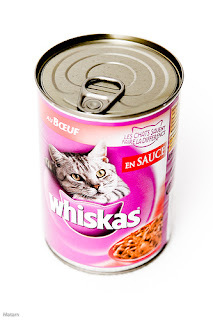 I would probably eat Whiskas. As you can imagine, constant exposure to free Kit Kats, Bannana Laffy Taffys (which will do in a pinch, but only then) and New Snickers "After Dark's" has taken away all of candy's magic, and a good amount of enamel. The noble candy bowl is the most basic of perks. I will go into other, more interesting ones in later posts. Are you KIDDING? Banana Laffy Taffys are in my top five. Bring them here and I'll barter with you.